Hinshaw, Noah, age 29, born in North Carolina; parents born in North Carolina; farmer. Hinshaw, Mary, wife, age 27, born in North Carolina; parents born in North Carolina; keeping house. Hinshaw, Emma D., daughter, age 5, born in North Carolina; parents born in North Carolina. Hinshaw, Charles A., son, age 4, born in North Carolina; parents born in North Carolina. Hinshaw, John F., son, age 1, born in North Carolina; parents born in North Carolina. Hinshaw, Noah, head-of-household, age 49, born Sept 1850 in North Carolina; parents born in North Carolina; married 26 years; occupation: farmer; owned farm (free). Hinshaw, Mary S., wife, age 47, born Aug 1852 in North Carolina; parents born in North Carolina; married 26 years; 11 children, 10 living. Hinshaw, Emma D., daughter, age 25, born Jan 1875 in North Carolina; parents born in North Carolina; occupation: servant. Hinshaw, John F., son, age 21, born Mar 1879 in North Carolina; parents born in North Carolina; occupation: day laborer. Hinshaw, Sallie I., daughter, age 17, born Mar 1883 in North Carolina; parents born in North Carolina; attended school 2 months. Hinshaw, Minus J., son, age 14, born Dec 1885 in North Carolina; parents born in North Carolina; attended school 3 months. 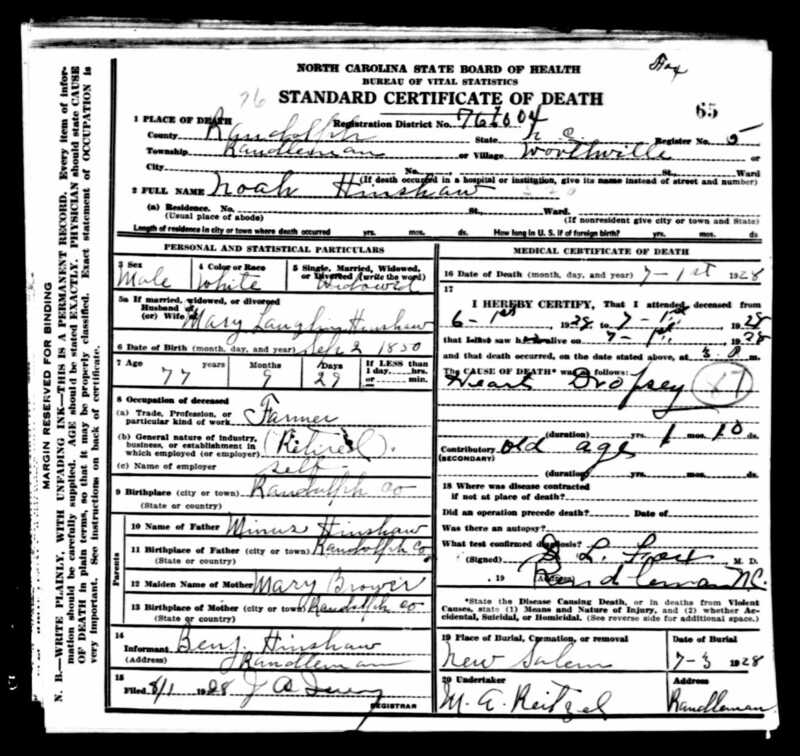 Hinshaw, Ben H., son, age 10, born Aug 1889 in North Carolina; parents born in North Carolina; attended school 1 month; cannot write. Hinshaw, Lilie L., daughter, age 8, born Oct 1891 in North Carolina; parents born in North Carolina; attended school 3 months. Hinshaw, Sible M., daughter, age 5, born June 1894 in North Carolina; parents born in North Carolina. Hinshaw, Addie M., daughter, age 3, born Apr 1897 in North Carolina; parents born in North Carolina. Hinshaw, Noah, head-of-household, age 59, born in North Carolina; parents born in North Carolina; first marriage, married 36 years; occupation: farmer, general farm; owned farm (free). Hinshaw, Mary S., wife, age 57, born in North Carolina; parents born in North Carolina; first marriage, married 36 years; 10 children, 8 living. Hinshaw, Lily L., daughter, age 18, born in North Carolina; parents born in North Carolina. Hinshaw, Sybil M., daughter, age 15, born in North Carolina; parents born in North Carolina. Hinshaw, Noah, head-of-household, age 69, born in North Carolina; parents born in North Carolina; widower; owned home; occupation: farmer, general farm. Varner, Sallie, daughter, age 37, born in North Carolina; parents born in North Carolina; married; occupation: none. Varner, Zelman, son, age 12, born in North Carolina; parents born in North Carolina; attended school. Varner, Roland, son, age 9, born in North Carolina; parents born in North Carolina; attended school. Varner, Basil, son, age 10 months, born in North Carolina; parents born in North Carolina. 1880 census, New Salem P.O., New Salem Township, Randolph County, North Carolina; roll T9-0978, page 39C, line #38, dwelling #177, family #180. 1920 census, Franklinville Twp., Randolph County, North Carolina; roll T625-1318, ED 104, page 15B, line #81, dwelling #303, family #303. 1910 census, West Franklinsville Township, Randolph County, North Carolina; roll T624-1128, ED 86, page 4A, line #41, dwelling #64, family #64. 1860 census, Cedar Falls P.O., Eastern Division, Randolph County, North Carolina; page 595, line #12, dwelling #1053, family #1053. 1870 census, Franklinsville P.O., Franklinsville Township, Randolph County, North Carolina; roll M593-1156, page 366, line #12, dwelling #283, family #265. 1910 census, West Franklinsville Township, Randolph County, North Carolina; roll T624-1128, ED 86, page 4A, line #34, dwelling #63, family #63. 1910 census, West Franklinsville Township, Randolph County, North Carolina; roll T624-1128, ED 86, page 4A, line #45, dwelling #65, family #65.